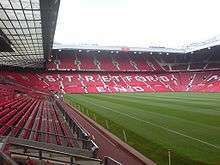 Nicknamed "The Theatre of Dreams" by Bobby Charlton, Old Trafford has been United's home ground since 1910, although from 1941 to 1949 the club shared Maine Road with local rivals Manchester City as a result of Second World War bomb damage. Old Trafford underwent several expansions in the 1990s and 2000s, including the addition of extra tiers to the North, West and East Stands, almost returning the stadium to its original capacity of 80,000. Future expansion is likely to involve the addition of a second tier to the South Stand, which would raise the capacity to around 95,000. The stadium's record attendance was recorded in 1939, when 76,962 spectators watched the FA Cup semi-final between Wolverhampton Wanderers and Grimsby Town. The dugout is in the centre of the Sir Bobby Charlton Stand, raised above pitch level to give the manager and his coaches an elevated view of the game. Each team's dugout flanks the old players' tunnel, which was used until 1993. The old tunnel is the only remaining part of the original 1910 stadium, having survived the bombing that destroyed much of the stadium during the Second World War. 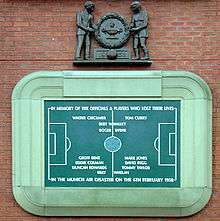 On 6 February 2008, the tunnel was renamed the Munich Tunnel, as a memorial for the 50th anniversary of the 1958 Munich air disaster. The current tunnel is in the South-West corner of the ground, and doubles as an entrance for the emergency services. In the event that large vehicles require access, the seating above the tunnel can be raised by up to 25 feet (7.6 m). The tunnel leads up to the players' dressing room, via the television interview area, and the players' lounge. 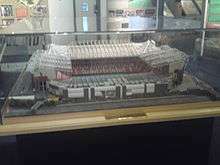 In 2009, it was reported that United continued to harbour plans to increase the capacity of the stadium further, with the next stage pointing to a redevelopment of the Sir Bobby Charlton Stand, which, unlike the rest of the stadium, remains single tier. A replication of the Sir Alex Ferguson Stand development and North-East and North-West Quadrants would see the stadium's capacity rise to an estimated 95,000, which would give it a greater capacity than Wembley Stadium (90,000). Any such development is likely to cost around £100m, due to the proximity of the railway line that runs adjacent to the stadium, and the corresponding need to build over it and thus purchase up to 50 houses on the other side of the railway. Nevertheless, the Manchester United group property manager confirmed that expansion plans are in the pipeline – linked to profits made from the club's property holdings around Manchester – saying "There is a strategic plan for the stadium ... It is not our intention to stand still". One criticism of the plans, however, is that increasing the height of the Sir Bobby Charlton Stand would further reduce the amount of light coming onto the pitch, which has caused problems in similarly large stadia – such as Wembley Stadium, the Santiago Bernabéu Stadium and the San Siro; according to Alex Ferguson, the developments on the other stands have already caused problems. It was also suggested that, should such an expansion take place, Old Trafford could be used instead of Wembley for big matches such as England internationals – in order to increase the ability of fans in the north of the country to watch England play; and FA Cup semi-finals – to maintain the prestige of the national stadium for the final. In March 2016 (ten years after the previous redevelopment), talk of the redevelopment of the Sir Bobby Charlton Stand re-emerged. 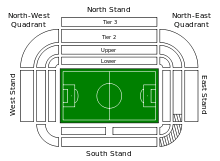 The stadium's provision for disabled fans is below standards required by regulations. Increasing capacity for disabled supporters is estimated to reduced overall capacity by 3,000. Five different solutions have been considered for the summer of 2017. One option is to increase the capacity up to 80,000 by adding a second tier to the Sir Bobby Charlton Stand, bringing it to a similar height to the Sir Alex Ferguson Stand opposite but without a third level. Replication of the corner stands on the other side of the stadium would further increase the stadium's capacity to 88,000 and increase the number of executive facilities. Housing on Railway Road and the railway line itself have previously impeded improvements to this stand but the demolition of housing and engineering advances mean that the additional tier could now be built at reduced cost. Adjacent to the Sir Bobby Charlton Stand of the stadium is Manchester United Football Ground railway station. The station is between the Deansgate and Trafford Park stations on the Southern Route of Northern Rail's Liverpool to Manchester line, and is only open on matchdays. The ground is also serviced by both the Altrincham, Eccles and East Didsbury lines of the Manchester Metrolink network, with the nearest stops being Exchange Quay at nearby Salford Quays, and Old Trafford, which it shares with the Old Trafford Cricket Ground. Both stops are a five-minute walk from the football ground. There are plans for the Wharfside tram stop to be built on Trafford Wharf Road, which is within close proximity of the stadium. The stop will link the proposed Trafford Park Line to the existing Pomona station, on the Eccles–Piccadilly Line. Buses 255 and 256, which are run by Stagecoach Manchester and 263, which is run by Arriva North West run from Piccadilly Gardens in Manchester to Chester Road, stopping near Sir Matt Busby Way, while Stagecoach's 250 service stop outside Old Trafford on Wharfside Way and X50 service stops across from Old Trafford on Water's Reach. There are also additional match buses on the 255 service, which run between Old Trafford and Manchester city centre. Other services that serve Old Trafford are Arriva's 79 service (Stretford – Swinton), which stops on Chester Road and 245 (Altrincham – Exchange Quay), which stops on Trafford Wharf Road, plus First Greater Manchester service 53 (Cheetham – Pendleton) and Stagecoach's 84 service (Withington Hospital – Manchester), which stop at nearby Trafford Bar tram stop. Visitors to the ground travelling by car can park in any of the ground's car parks, which are all within 0.5 miles (0.8 km) of the stadium. 1 2 3 4 "Manchester United - Stadium" (PDF). premierleague.com. Premier League. Retrieved 9 September 2016. ↑ "Manchester Sightseeing Bus Tours". Retrieved 15 July 2015. ↑ "Manchester Utd Football Gd (MUF)". National Rail. Retrieved 15 July 2011. ↑ "FA Cup Final Venues". TheFA.com. The Football Association. Retrieved 11 September 2016. ↑ "1911 FA Cup Final". fa-cupfinals.co.uk. Retrieved 4 September 2008. ↑ "1915 FA Cup Final". fa-cupfinals.co.uk. Retrieved 4 September 2008. ↑ "The OT Story: 1910–1930". ManUtd.com. Manchester United. 18 January 2010. Retrieved 15 July 2011. ↑ Philip, Robert (1 February 2008). "How Matt Busby arrived at Manchester United". The Daily Telegraph. London: Telegraph Media Group. Retrieved 21 August 2008. 1 2 3 4 "Old Trafford 1909–2006". manutdzone.com. Archived from the original on 17 February 2008. Retrieved 11 December 2011. ↑ Hibbs, Ben (15 August 2006). "OT atmosphere excites Ole". ManUtd.com. Manchester United. Retrieved 26 January 2011. ↑ Macchiavello, Martin (18 December 2009). "Nostalgia Alá vista" (in Spanish). Olé. Retrieved 18 July 2010. ↑ Pearson, Geoff (December 2007). "University of Liverpool FIG Factsheet – Hooliganism". Football Industry Group. University of Liverpool. Retrieved 4 September 2008. ↑ "Old Trafford". waterscape.com. Retrieved 21 August 2008. ↑ "Men's Senior Team Results". TheFA.com. The Football Association. Retrieved 31 January 2010. ↑ Sinnott, John (7 February 2007). "England 0–1 Spain". BBC Sport. British Broadcasting Corporation. Retrieved 9 September 2008. ↑ "Man Utd 3–0 Birmingham". BBC Sport. British Broadcasting Corporation. 26 March 2006. Retrieved 29 January 2011. 1 2 Coppack, Nick (31 March 2007). "Report: United 4 Blackburn 1". ManUtd.com. Manchester United. Retrieved 26 January 2011. ↑ Morgan, Steve (March 2010). McLeish, Ian, ed. "Design for life". Inside United. Haymarket Network (212): 44–48. ISSN 1749-6497. ↑ Bartram, Steve (19 November 2009). "OT100 #9: Record gate". ManUtd.com. Manchester United. Retrieved 19 November 2011. ↑ Bostock, Adam (25 January 2010). "My Old Trafford". ManUtd.com. Manchester United. Retrieved 26 January 2011. ↑ Bartram, Steve (19 February 2010). "OT100: The Top 10 revealed". ManUtd.com. Manchester United. Retrieved 26 January 2011. ↑ Nichols, Matt (14 January 2010). "OT art competition". ManUtd.com. Manchester United. Retrieved 26 January 2011. 1 2 Bartram, Steve (19 February 2010). "New OT exhibit unveiled". ManUtd.com. Manchester United. Retrieved 26 January 2011. ↑ Nichols, Matt (14 January 2010). "OT history on display". ManUtd.com. Manchester United. Retrieved 26 January 2011. ↑ Bostock, Adam (12 March 2010). "Stadium set for centenary match". ManUtd.com. Manchester United. Retrieved 26 January 2011. ↑ Nichols, Matt (14 March 2010). "Dream day for 1910 relatives". ManUtd.com. Manchester United. Retrieved 26 January 2011. ↑ "Old Trafford". London2012.com. London 2012. Retrieved 2 August 2012. ↑ "Football – event schedule". BBC Sport. British Broadcasting Corporation. 30 March 2012. Retrieved 28 July 2012. ↑ Borden, Sam (30 July 2012). "Rare at Old Trafford: A Women's Match". The New York Times. The New York Times Company. Retrieved 31 July 2012. ↑ Gibson, Sean (3 June 2016). "Soccer Aid 2016, England vs Rest of the World: What time is kick-off, what are the teams and which TV channel is it on?". Telegraph.co.uk. Telegraph Media Group. Retrieved 3 June 2016. ↑ "Seating Plan". ManUtd.com. Manchester United. Retrieved 26 January 2011. ↑ "Executive Club". ManUtd.com. Manchester United. Retrieved 1 August 2011. ↑ "Virtual Tour – The Museum". ManUtd.com. Manchester United. Retrieved 26 January 2011. ↑ Bartram, Steve (14 January 2010). "OT100 #66: Pele's visit". ManUtd.com. Manchester United. Retrieved 26 January 2011. ↑ "Man Utd rename Old Trafford stand in Ferguson's honour". BBC News. British Broadcasting Corporation. 5 November 2011. Retrieved 5 November 2011. 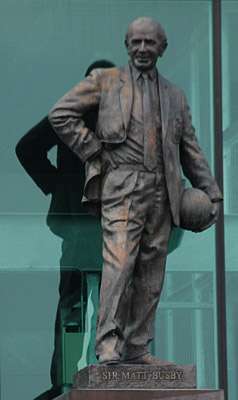 ↑ "Sir Alex Ferguson pride as Manchester United unveil statue". BBC Sport. British Broadcasting Corporation. 23 November 2012. Retrieved 23 November 2012. ↑ "The Suites". ManUtd.com. Manchester United. Retrieved 26 January 2011. ↑ "Virtual Tour – Dugout". ManUtd.com. Manchester United. Retrieved 7 February 2008. ↑ "Football honours Munich victims". BBC Sport. British Broadcasting Corporation. 6 February 2008. Retrieved 7 February 2008. ↑ "Virtual Tour – Player's Tunnel". ManUtd.com. Manchester United. Retrieved 7 February 2008. ↑ "Sir Bobby Charlton stand unveiled at Old Trafford". BBC. 3 April 2016. Retrieved 3 April 2016. ↑ "South Stand at Old Trafford to be renamed after Sir Bobby Charlton". ManUtd.com. Manchester United. 15 February 2016. Retrieved 3 April 2016. ↑ Moore, Glenn (19 November 1996). "Football: You only sing when you're standing". London: Independent, The. Retrieved 22 August 2008. 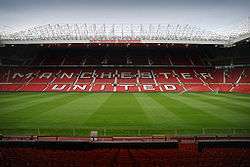 ↑ "Alfred McAlpine wins £7.2m contract to redevelop Stretford End at Manchester United FC's stadium". The Construction News. 28 May 1992. Retrieved 21 August 2008. ↑ "Denis Law". ManUtd.com. Manchester United. Retrieved 29 January 2011. ↑ "Away fans won't move". ManUtd.com. Manchester United. 22 May 2012. Retrieved 22 May 2012. ↑ Moore, Glenn (19 November 1996). "Football: You only sing when you're standing". The Independent. London: Independent Print. Retrieved 8 February 2008. ↑ Hibbs, Ben (29 May 2008). 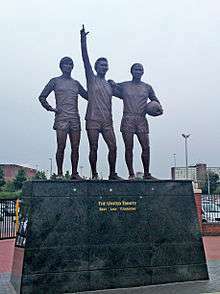 "United Trinity honoured". ManUtd.com. Manchester United. Retrieved 26 January 2011. 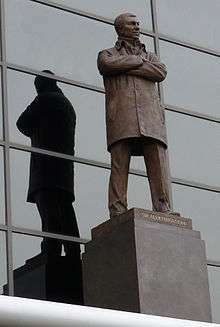 ↑ "Man Utd 'trinity' statue unveiled". BBC News. British Broadcasting Corporation. 29 May 2008. Retrieved 30 May 2008. ↑ Keegan, Mike (23 July 2015). "Manchester United will rake in £750m from the new adidas deal... so here, Sportmail looks at what went on behind the scenes as their 13-year relationship with Nike ended". Mail Online. Associated Newspapers. Retrieved 6 August 2015. ↑ Nixon, Alan (30 January 2001). "Football: FA charges Neville as United tear up pitch". The Independent. London. ↑ "Fergie wants 'awful' Old Trafford pitch dug and relaid in time for Manchester derby". Daily Mail. Associated Newspapers. 30 January 2008. Retrieved 6 February 2008. 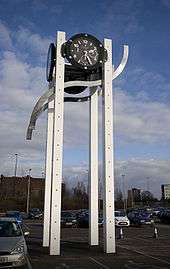 ↑ "Hublot clock unveiled". ManUtd.com. Manchester United. 28 August 2009. Retrieved 26 January 2011. ↑ Thompson, Gemma (17 May 2011). "Neville launches fans' HQ". ManUtd.com. Manchester United. Retrieved 11 July 2011. ↑ "Manchester United set to make Old Trafford bigger than Wembley". The Daily Telegraph. London: Telegraph Media Group. 5 May 2009. Retrieved 5 May 2009. ↑ "Watch out Wembley: Manchester United chiefs plan to dwarf National Stadium with 95,000 expansion of Old Trafford". Daily Mail. Associated Newspapers. 5 May 2009. Retrieved 5 May 2009. ↑ "Fergie wants 'awful' Old Trafford pitch dug and relaid in time for Manchester derby". Daily Mail. Associated Newspapers. 30 January 2008. Retrieved 17 May 2009. ↑ Hatchet Man (5 May 2009). "Bigger than Wembley and more convenient – why a revamped Old Trafford must stage the top games". Daily Mail. Associated Newspapers. Retrieved 5 May 2009. ↑ Mitten, Andy (28 March 2016). "Manchester United consider expanding Old Trafford capacity to hold 80,000". ESPN FC. ESPN. Retrieved 24 April 2016. ↑ Herbert, Ian (9 September 2006). "Top football clubs played host to Scots sport of shinty". The Independent. London. Retrieved 23 August 2007. ↑ "Lambert and Butler Floodlit Competition 1981". CricketArchive. Retrieved 3 June 2014. ↑ "Super League Grand Final to stay at Old Trafford until 2017". BBC Sport. British Broadcasting Corporation. 4 October 2013. Retrieved 5 October 2013. ↑ Fagan, Sean (2006). "Kangaroo Tour: 1986". RL1908.com. Retrieved 23 May 2009. ↑ "Carnegie World Club Challenge 1989–90". superleague.co.uk. Super League. Archived from the original on 6 March 2009. Retrieved 15 March 2009. ↑ "Past Winners – 2000". Official Website of Rugby League World Cup 2008. BigPond. 2008. Retrieved 15 March 2009. ↑ "Rugby League World Cup: Old Trafford to host 2013 final". BBC Sport. British Broadcasting Corporation. 3 May 2012. Retrieved 24 September 2012. ↑ Fletcher, Paul (30 November 2013). 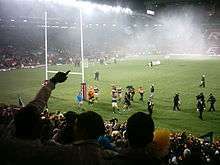 "Rugby League World Cup 2013: New Zealand 2-34 Australia". BBC Sport. British Broadcasting Corporation. Retrieved 2 December 2013. ↑ "Kangaroos have Old Trafford safety worries for Rugby League World Cup final against New Zealand". ABC News (Australian Broadcasting Corporation). 30 November 2013. Retrieved 1 August 2014. ↑ "England to play at Old Trafford". BBC Sport. British Broadcasting Corporation. 3 February 2009. Retrieved 3 February 2009. ↑ "England 37–15 Argentina". BBC Sport. British Broadcasting Corporation. 6 June 2009. Retrieved 7 June 2009. ↑ "England will host 2015 World Cup". BBC Sport. British Broadcasting Corporation. 28 July 2009. Retrieved 15 September 2009. ↑ Bartram, Steve (9 October 2013). "Boxing's big night at OT". ManUtd.com. Manchester United. Retrieved 10 October 2013. ↑ Ferguson, Alex (22 March 1992). "Good pitches make for good matches". New Sunday Times. Kuala Lumpur: New Straits Times Press. p. 20. Retrieved 8 January 2015. ↑ "Conferences & Events". ManUtd.com. Manchester United. Retrieved 26 January 2011. ↑ Marshall, Adam (5 August 2011). "United 6 New York Cosmos 0". ManUtd.com. Manchester United. Retrieved 26 August 2011. ↑ "Season 1949/50 – Matches and Teamsheets". StretfordEnd.co.uk. Retrieved 5 September 2008. ↑ "Season 2006/07 – Season Summary". StretfordEnd.co.uk. Retrieved 5 September 2008. ↑ "Season 2008/09 – Season Summary". StretfordEnd.co.uk. Retrieved 14 July 2009. ↑ "Network Map" (PDF). Northern Rail. Retrieved 7 February 2008. ↑ "Old Trafford". Metrolink. Retrieved 7 February 2008. ↑ "Wharfside". Transport for Greater Manchester. Retrieved 19 July 2014. 1 2 "Manchester South Network Map" (PDF). Greater Manchester Passenger Transport Executive. Retrieved 19 February 2010. ↑ "255". Stagecoach Bus. Retrieved 10 September 2012.